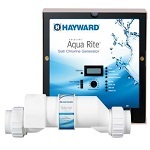 The Hayward AQR15 AquaRite Salt Chlorination System, manufactured by Hayward, comes with a 3 year warranty and is boasted as the world’s “Number 1” salt water chlorinator. Hayward is a leader in pool technologies and has been manufacturing pool equipment for over 80 years. The manufacturer boasts that there are over 1 million of these units installed world wide and that there are more of their systems installed than any other two manufacturers put together. The Aqua Rite AQR3, AQR9 and AQR15 models are designed for pool capacities of up to 15000, 25000, and 40000 gallons respectively. They will bring you the very best in clean, sparkling, soft silky water. This series has even been independently certified by the National Sanitation Foundation. Featuring easy installation, this unit just plugs into any 120V outlet and can be installed without a certified electrician. The chlorinator is a low maintenance unit due to its self cleaning functionality. Using reverse polarity, the cell can discard whatever calcium build up is present – more fun less work! The Hayward AQR15 AquaRite Salt Chlorination System may occasionally need a manual clean of the cell plates if calcium build up becomes too great. Conveniently, Hayward sell a stand to sit the chlorinator cell in whilst it is being cleaned. You can view the stand on Amazon by following this link – Hayward GLX-CELLSTAND Cleaning Stand Replacement for All Hayward Turbo Cells. All you have to do is screw the cell assembly into the stand and fill it up with a cleaning solution. You can use a muratic acid solution to clean the cell. We have an article on muritac acid if you are interested in reading more about cleaning chlorinator cells with it – Cleaning a Salt Water Chlorinator Cell with Muriatic Acid. 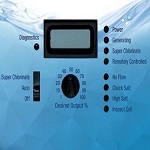 The Hayward AQR15 AquaRite Salt Chlorination System comes with a control unit that combines ease of use with enough diagnostics to give you a clear picture of what’s going on with your pool at a glance. It features multiple LEDs indicators that include No Flow, Check (Low) Salt, High Salt and a Inspect Cell indicator. A simple dial lets you adjust the chlorine output in seconds. This unit comes with a 3 year warranty which is quite respectable. Most manufacturing faults would be uncovered in the first year or two of operation so you can rest easy that you will be covered. Customer reviews on Amazon give this product 4.7 out of 5 stars and have written describing how easy the product is to install and how it has made their pool very low maintenance; there are lots of very positive reviews for this product. Intex Krystal Clear Saltwater System with E.C.O. How Does A Self Cleaning Saltwater Chlorinator Work? As an Amazon Associate we earn from qualifying purchases at no extra cost to you.